Being a fan of super hero comics and Japanese anime, I was delighted to hear of Mecha Manga Bible Heroes, a futuristic retelling of David and Goliath complete with huge armoured robots (mecha) drawn in a manga style! Alongside the various other comic and manga Bibles starting to spring up, this version will be most welcome. For more, check out the Manga Bible series starting with ‘Names, Games and the Long Road Trip‘ and working it’s way through the Old Testament, or try the Manga Bible by Siku. 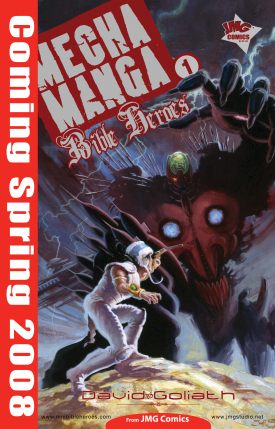 I’m not sure when and how the Mecha Manga Bible Heroes will be available in the UK, but it will certainly pique the interest of a number of boys in our Ignite group. Hey thought you would like to know that our MMBH comic book is due late this month, July of 2008. Feel free to check out the http://www.deepershopping.com site for your copy.